Should local businesses use video for their marketing? Should ANY business use video? When I ask some marketers why they are using video, often I’m given the wrong answer such as “everyone is using it”, “video is cool to use”, or “video costs less now than before”. Whilst all those statements are correct, none of them answer the question WHY should a local business use video. Local and small businesses have challenges when it comes time to invest in their marketing. Typically they have limited cash flow and the owners are time poor as they spend a lot of their time working on their business. They don’t have the skills, knowledge nor equipment to produce their own videos or the resources to outsource their videos. Many video production companies complain that these businesses see video as an additional cost rather than an investment for their business. But really who is to blame for this? Personally, everyone knows I am passionate about video. But the truth is, video alone, is absolutely worthless. In fact it’s a waste of time and money – unless you know how to use it. A “Welcome” or “About Me” video on your website generally will not provide a Return On Investment (ROI). It may enhance your website, it may keep visitors longer and more engaged on your website and it may eventually lead sales. But who really knows. How do you measure the effect of the video? After all, they are already on your website and you will not be able to measure the effect from your video. This is a hard sell because if you cannot measure the effect of your video on sales, there will be no direct return on investment. So how do you define the real value of video for a business? Video is not the end product. It is a tool. It is a part of a bigger strategy. 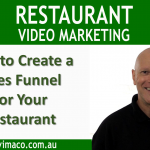 And the strategy must answer this question – how do you use the video to get you the business results you want. It starts with strategy and ends in results. Video can be successfully used to increase brand awareness, grow your email list, nurture your leads and staying top of mind but the bottom line must be to get more new or existing customers, which results in more sales, more revenue, more profit. That is something every business owner can understand. Video must connect to this process or else it has no business value and will always be considered a cost rather than an investment. Here I have outlined the 5 Step Process for the Video Content Marketing Strategy for Local Business. Research the key words that your potential customers use in search that relate to your business. What are the problems they want to resolve? What are their Pain Points? The more pain they feel, the more urgent will be their need. Create short videos (2 to 3 mins) that answer your target audience’s questions. Use social proof to show that you can actually provide them with a solution to their problem. It is essential to build trust and authority with consistent and quality content. Upload the videos to Youtube and take full advantage of the second largest search engine in the world. Then optimise your video for search results using the video’s title, description, thumbnails and backlinks. Your objective is to get your videos ranked on the first page on Google and Youtube so that it can be discovered by your target audience. Then upload your video to Facebook and run a paid campaign targeting your local area and the demographics and interests of your ideal customer. Finally use your email list by sending them a link to your video. This process is known as lead nurturing where you stay top of mind until they are ready to buy from you. There is no need to use every social media platform, just Youtube, Facebook and your email list unless your target audience use other specific platform such as Pinterest or Instagram. Tell your audience what you want them to do. * Send them to your website for more information. * Get them to call you. Look at the number of views, retention rates, demographics, and action taken. Tweak your videos to improve the performances and see how it correlates to sale results. A video by itself has no real value for a business. It’s the results of what the video can do that count. Strive to rank your videos on the first page of Google for your keywords, and this will generate a steady flow of new leads each month. That is how Local Business should use video. It’s not about how to make a video for you, but what the video can make for you.